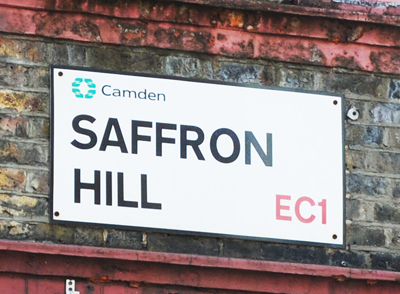 The name of this central London thoroughfare – which runs from Fleet Street to a dead-end just shy of Holborn, with New Fetter Lane forking off to continue the journey to Holborn Circus – has nothing to do with fetters, chains or prisoners. Rather its name – a form of which apparently first starts to appear in the 14th century – is believed to be a derivation of one of a number of possible Anglo-French words – though which one is anyone’s guess. The options include the word fewtor, which apparently means an idle person or a loafer, faitor, a word which means an imposter or deceiver (both it and fewtor may refer to a colony of beggars that lived here) feuterer, a word which describes a ‘keeper of dogs’, or even feutrier, another term for felt-makers. 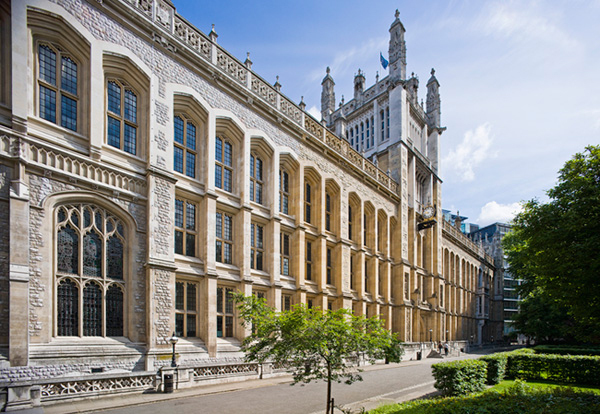 Buildings of note in Fetter Lane include the former Public Records Office (now the Maughan Library, part of King’s College, it has a front on Chancery Lane but backs onto the lane), and the former Inns of Chancery, Clifford’s Inn and Barnard’s Inn (current home of Gresham College). 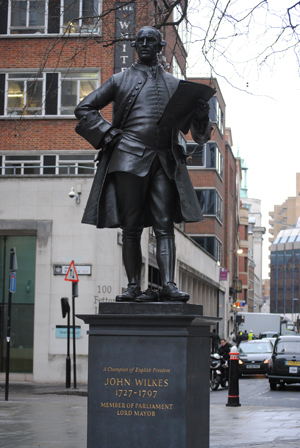 And there’s a statue of MP, journalist and former Lord Mayor, John Wilkes, at the intersection with New Fetter Lane (pictured). • Four hundred years of London’s history is being put online as part of a new project on the City of Westminster’s website. 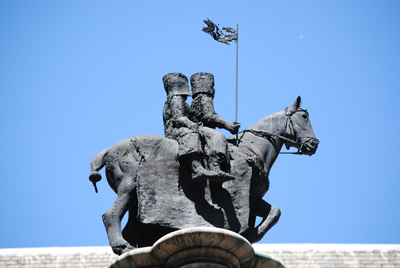 The council is publishing a new picture depicting a different historical event from the city’s tumultuous history every day throughout 2011 under its A date with history project. 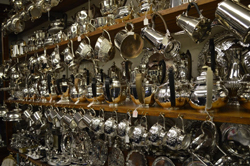 The images, taken from the council’s archives, include photographs, engravings and sketchings. They include a black and white photo of queues of people waiting on Vauxhall Bridge to pay their final respects to King George V lying in state at Westminster Hall after his death on 20th January, 1936, another photograph showing the King and Queen with PM Winston Churchill inspecting damage to Buckingham Palace’s swimming pool following a raid during the Blitz in September, 1940, a hand-colored print depicting the execution of King Charles I on 30th January, 1649, and an engraving showing a comet passing by the spire of St Martin in the Field in 1744. 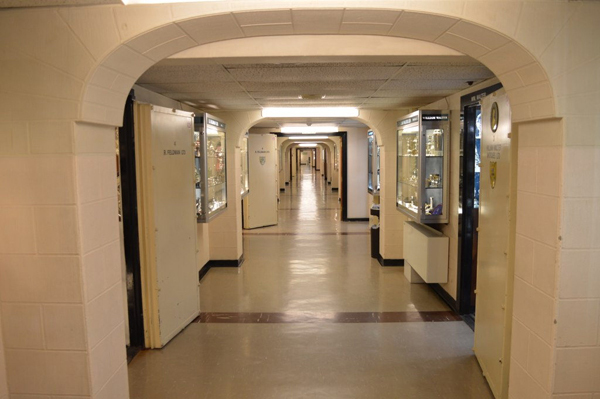 It is the first time the images have been made freely available online. To see the images, head to www.westminster.gov.uk/archives/day-by-day. • What could be London’s oldest structure has been unearthed on the Thames foreshore. Six timber piles up to 0.3 metres in diameter have been discovered only metres from the MI6 headquarters in Vauxhall, part of what archaeologists believe is part of a prehistoric structure which stood on the river bank more than 6,000 years ago during the Mesolithic period when the river was lower. The find, made by a Thames Discovery Programme team, is only 600 metres away from a Bronze Age timber bridge or jetty dating from 1,500 BC which was discovered in 1993. The piles may be able to be seen from Vauxhall bridge during low tides between 10.25am on 22nd January and 11.15am on 23rd January. • Homes in London were purchased for an average price of £14,000 back in 1910, according to land tax valuations documents released online this week. Ancestry.co.uk has placed the London, England Land Tax Valuations 1910 – compiled as part of David Lloyd George’s 1910 Finance Act, known as the Domesday Survey – online to help people discover more about the financial situations of their ancestors. The documents put the value of the Bank of England at £110,000, the Old Bailey at £6,600, and Mansion House at a more impressive £992,000. The average value of property on Fleet Street was £25,000 (compared with £1.2 million today) while in Cannon Street, the average value was £20,000 (£2.2 million) and in Chancery Lane, the average value was just £11,000 (£1.1 million). The man behind what is perhaps the most famous quote about London – “When a man is tired of London, he is tired of life” – Samuel Johnson was a noted writer, critic and raconteur of the 18th century whose work included a then unparalleled English language dictionary. Often simply referred to as “Dr Johnson”, Johnson was also the subject of one of the most famous biographies ever written – that of his friend James Boswell’s aptly named Life of Samuel Johnson. Born in 1709 in Lichfield, Staffordshire (the home is now a museum), Johnson – who often struggled with poor health and depression – was the son of a bookseller who managed to help fund his brief time at Pembroke College in Oxford before lack of funds meant he had to leave without a degree (he was later awarded an honorary degree). He worked with his father and as a tutor before eventually, in 1737, heading to London with his friend and former pupil, actor David Garrick, and there worked for the rest of his life as a writer producing works including magazine articles and essays, poetry, sermons, and biographies. 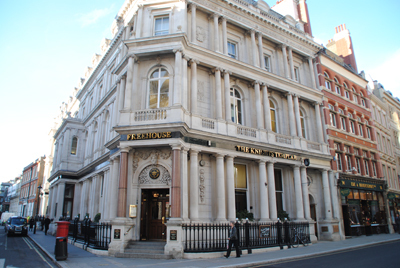 In 1746, he was commissioned to produce the dictionary and rented a property at 17 Gough Square, not far from Fleet Street, where he would spend the nine years working in it. Published in 1755, the dictionary was a remarkable work which not only won him acclaim ever since but also resulted in King George III granting Johnson a modest pension for the rest of his life (he had previously been arrested for debt). 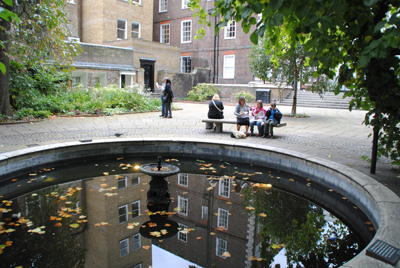 The Gough Square house is these days open to the public and includes an exhibition on Johnson’s life, particularly with regard to his time there (there’s a statue of his cat Hodge in the square itself). 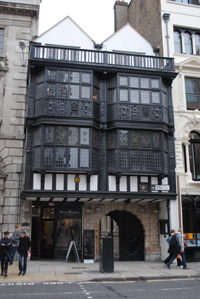 Other sites which Johnson is known to have frequented include Ye Olde Cheshire Cheese in Fleet Street, the Anchor Inn in Bankside, the Theatre Royal Covent Garden (now the Royal Opera House) in Bow Street where the Beefsteak Club met, and St John’s Gate in Clerkenwell where he once had an office. Johnson married an older widow, Elizabeth Porter, in 1735, but she died in 1752 and it was following her death that Francis Barber, a former Jamaican slave, moved in as his servant, eventually becoming Johnson’s heir. Johnson’s friends included some of the great luminaries of the time, including artist Joshua Reynolds, philosopher Edmund Burke, poet Oliver Goldsmith, and, of course, Boswell. 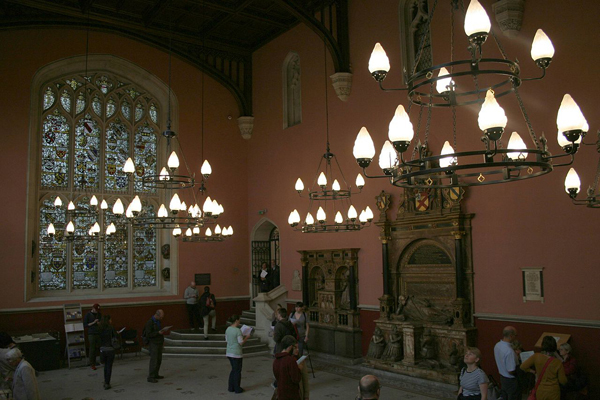 Following a series of illnesses, Johnson died in 1784 and was buried in Westminster Abbey. The 300th anniversary of his death was marked with a series of events last year including a re-enactment of the walk Johnson and Garrick made from Lichfield to London. 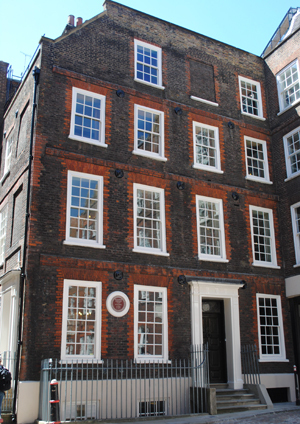 Dr Johnson’s House (17 Gough Square, nearest tube is Temple, Holborn or Chancery Lane) is open Monday to Saturday, 11am-5.30pm (5pm from October to April). Entry costs £4.50 an adult, £3.50 for concessions, £1.50 for children and family tickets are available for £10. For more information, see www.drjohnsonshouse.org.